1. Acuteness (see acute [def. 2]); the level of severity of an illness. This is one of the parameters considered in patient classification systems that are designed to serve as guidelines for allocation of nursing staff, to justify staffing decisions, and to aid in long-range projection of staffing and budget. 2. clearness of the visual perception of an image. visual acuity the ability to discriminate visually between forms. 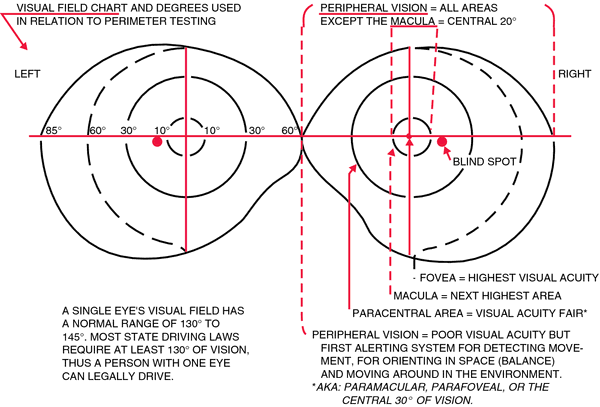 Visual field chart illustrating the divisions of the visual field related to visual acuity. (Courtesy of Josephine C. Moore, PhD, OTR.) From Pedretti and Early, 2001.
detection of a target having two or more parts, often measured by using the Snellen test types; indicated by two numbers: the first represents the distance at which a patient sees the test types (usually 6 m. or 20 ft.), and the second, the distance at which the test types subtend an angle of 5 min. ; for example, vision of 6/9 indicates a test distance of 6 m. and recognition of symbols that subtend an angle of 5 min. at a distance of 9 m.
Sharpness of vision, especially as tested with a Snellen chart. Normal visual acuity based on the Snellen chart is 20/20. 1 a measure of the resolving power of the eye, particularly with its ability to distinguish letters and numbers at a given distance. 2 the sharpness or clearness of vision. Sharpness or clarity of vision, measured as the ability to distinguish letters or other images of various sizes at a fixed distance, usually with a Snellen chart. Normal rating by such means is 20/20 vision. The extent to which an eye is capable of resolving fine detail. Visual acuity is measured by means of a SNELLEN'S CHART TEST. The ability to distinguish details and shapes of objects. Inability to recognize the import of sensory stimuli (e.g. to recognize colour, faces, shape and the orientation of objects), although the receptors and the sensory pathway are intact. The condition is attributed to bilateral lesions in the association areas of the cortex. If the sense of sight is affected, it is called visual agnosia (perceptual or psychic blindness). See alexia; optical apraxia; prosopagnosia. Inability to write, usually as a result of a brain lesion. If the person can write from dictation but not from copying, it is called visual agraphia. Visual vestibular interaction in the dynamic visual acuity test during voluntary head rotation. First post-operative day visual acuity and intraocular pressure were measured and patients were discharged after recording the post operative complications. The findings of this study underscore a continued need for national visual acuity data from representative U. In this project, gender and location of schools made significant differences in subnormal visual acuity of children. Before each task was performed, baseline values of accommodation power, CFF, and visual acuity were measured. A two-line or more improvement in visual acuity defined significant refraction errors. Data showed that at one week following treatment with the Raindrop in the non-dominant eye, 19 of 25 subjects achieved uncorrected 20/25 or better near visual acuity with an average gain in near vision of 4 lines using the Optec 6500 visual acuity tester. Finally, the author mentioned that the increase in visual acuity is usually unlikely and that alternative diagnosis should be considered. Under the two pivotal Phase 3 clinical trials investigating the superiority of Fovista (pegpleranib) anti-PDGF therapy in combination with Lucentis (ranibizumab) anti-VEGF therapy compared to Lucentis monotherapy, the company stated that it did not achieve the pre-specified primary endpoint of mean change in visual acuity at 12 months in wet age-related macular degeneration (AMD) patients. Starting with how to measure visual acuity, I could see that many faces drew blank after about 30 minutes. In people with vision loss from diabetic macular edema, treatment with intravitreal RG7716 resulted in clinically meaningful and statistically significant improvements in visual acuity gains compared with ranibizumab alone.